So, lets cover how I came up with the idea of Act of Treason. This journey started about 4 years ago. So forgive me if my memory is a little fuzzy, but I certainly remember the broad strokes. I won’t bother going into what Act of Treason is. For that you can visit www.playaot.com to find out more information. I was really getting into board games back in the day. Settlers of Catan, 7 Wonders, Dominion, Power Grid, Claustrophobia, etc. A lot of the popular ones, and a few of the lesser known. I was having a grand old time. Then I started playing social deduction games like Mafia, Werewolf, and Battlestar Galactica. I loved these games! The social aspects of these games were awesome, but I always felt there was room for more. They left me feeling like the mechanics actually didn’t lend itself to real deduction - the mechanics got in the way. There was room for improvement. These games also had some mechanics that dampen the experience and could have used some mitigation. A good example of this is in mafia, how one person always dies at the start without any knowledge. They just die. This one mechanic alone is of such detriment that games like one-night werewolf and The Resistance have started cropping up. Sure these games have other aspects top them, but I feel like one of their primary goals was to remove that one flaw - early player elimination. And it's fair enough because it's a fairly big negative. Act of Treason has player elimination, but mitigates early player elimination by providing strong incentives to keep everyone alive - because once the killing starts, it doesn't stop! So all players typically die at the same time, or there abouts. keep it simple. Only start with mechanics that directly feed into point 1. Honestly, the game will likely change a lot from your first few prototypes. Don't spend ages analyzing every tiny detail. Get the core parts in that derive the most enjoyment and get them functional. It’s best to just strip out everything that isn’t core, and just see how the concept performs. How the ‘fun’ parts work. Is it actually fun? Why? Why not? If not how can we tweak this to get to the fun? For Act of Treason, I did exactly that - whittled down the game to only the core parts. The social deduction. The game essentially had Tribute (all players secretly contribute cards to check to determine who wins the round), and the ability to assassinate that that was really it. These were the mechanics that got people talking and accusing one another. The fun part of the game. And it worked! It was the third prototype and it really had people loving the game. It had a lot of flaws for sure. But people enjoyed the game in spite of them. I had managed to target the fun part of the game and create mechanics that allowed players to tap into it. It was actually pretty quick for me to reach that point. What took much longer is honing in on how to improve the mechanics, what mechanics worked best, and how to mitigate the negative mechanics. That takes a long time, and often I would try out a mechanic only to find that it added too much complexity, or got in the way of social deduction. 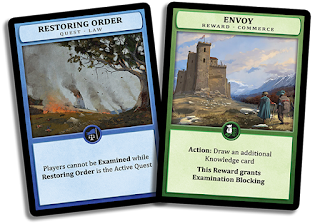 The Act of Treason third prototype is similar in a lot of ways to the final prototype, but I’ve tried so many things in-between now and then only a few of the mechanics stuck. A lot of changes were simply small revisions that improve the quality of life of the game. I strongly believe that Act of Treason hasn’t changed from the 3rd revision that much because early on I focused on what was fun and threw out anything else I didn’t need – because anything else would just get in the way of the fun! And that's how every game should be. Even now the game still has that format. It's just that the mechanics are even better streamlined to promote the fun - the social deduction. What aspects makes the game fun and how can it be improved. What aspects detract from the enjoyment of the game and how can we mitigate or remove them. Is it really that easy? Well, no - it's a simplification. However, I can’t stress enough how important it is to remove the negative features in a game and to understand what makes your game fun. These are vial and arguably the most important things that turn a good game, into a fantastic game. I’ll try cover this off in a video on my channel OverIceProductions at some point in the future because it is important. I feel there are many games out there that don’t do this enough - especially point 2 - removing the negative aspects. That is what provides the balance and polish. Phew that was a lot! I have no idea what we'll cover off next week - it'll likely be shorter - something fluffy. Then maybe after that we’ll do something similar to this post and cover off some specific design examples within Act of Treason. Welcome to the Blog of Treason! It's not really a Blog about Treason or anything like that. It's a blog for my game: Act of Treason. Catchy right? It's not just a self-serving blog either. I hope to provide you with value: I hope to engage you and give you food for thought. I'll be covering a range of topics. Whatever is on my mind at the time. Although, to be fair - we're going to start with the Act of Treason stuff. It is the Blog of Treason after all. It has to be true to it's word (or does it? It is the Blog of Treason after all). I'll do my best to blog once a week, usually on the weekend. I'm also going to include a weekly feature where I share an interesting YouTube video or some catchy music that I stumbled across. I love sharing things like this with people and I'm sure that you'll be able to get something good out of it. Anyway - that's by the by. I've spent the last long while working away at getting an online presence for AoT. The website (playaot.com) is almost ready to launch now and it's looking really nice. Hopefully by the end of this week or next it will be launched. Took roughly 3 weeks of most of my time and it was some solid work. You can check out a screenshot below. I've also got myself up and running with an AoT Facebook page, an AoT Twitter account, and now a AoT Blog! The BoT. There is still a little bit of setup to do with each of these, but as they are not urgent, they will have to wait a little while to become fabulous. It’s been a wild ride to get to this point and there is no doubt in my mind it’s about to get 100x more wild. Here’s the thing. I never really wanted to have to do all this marketing crap. It’s not what I’m good at - It’s not what I like doing. But people love this game, and I know how good it is. I just couldn't live with myself if I didn't see it through to the end. Honestly, if AoT wasn't as good as it is I would have stopped working on it a long time before. It's a compulsion to do public good at this point. So with all that said, I’m going to have to become good at this marketing crapt. So, I’ll be doing lots on the social media front. Advertising, promotions etc. All leading up to the big day on Kickstarter. If you'd like to help out or get in touch - you can contact me here: playaot.com/contact. We only have one shot at this kickstarter thing - and if it goes well, you can expect to see more top quality games from me. *For sure* I already have some ideas in my belt. I just need the time to work on them. I know I've not really covered Act of Treason much in this post. Lots of detail will up on the site really soon. Next week I'll cover some basic concepts of the game, and the background into how I came up with the idea. Quite upbeat. Awesome bit at 2:42 where it breaks into music right from Castlevania (I think); utterly fantastic. My only wish is that this was a larger part of the song.